I always like to support my local club and Oulton Park is a good circuit from a set up perspective too. 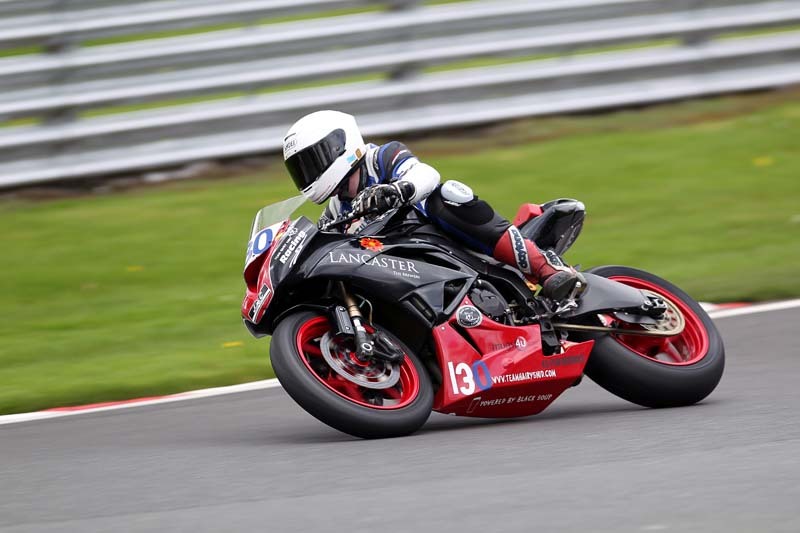 I entered the Saturday race and Friday test day hoping for some dry time on the bike, having raced in three meetings so far with two being wet. I’d had some much bigger baffling put into the tank in the week running up the event, so wanted to test on low fuel levels again in preparation for the TT. The Friday started wet and I sat out the first couple of sessions, going out in the patchy damp third session purely to test the tank. The problem was loads better, getting right down to just under two litres before any real issue started. Some explosafe foam added and the problem was improved further, now at a point I think won’t cause an issue at the TT. One dry session in the afternoon revealed that the bike was now struggling for power at full throttle, I guessed it would relate to a blocked fuel filter in the pump ( due to all the welding/grinding etc that the tank had been subject to recently) you can never flush all of the bits out of the tank. I swapped the filter and tried again, fault still present but it was obviously a fuelling issue. Running out of time and the rain coming down again I swapped the fuel pump with the innards of a GSXR one (which are all but identical) and hoped this would fix the problem for Saturday’s racing. Saturday came and was a marked improvement in the weather, a welcome relief after all the recent rain. I found a small leak in the fuel tank, same spot as before, so the chemical metal was out again as a temporary fix. Five minutes later I managed to cross thread the front wheel spindle nut whilst swapping the wheels. I was pretty much ready to throw in the towel and go home, brother in law Stuart and James from Infront Motorcycles along with Joanne dived in and helped out with the bike. We swapped the spindle nut from the ZX6, which I was also racing to prep for the TT, for practice. Fortunately the fuel pump swap had fixed the problem, good job really as I reckon I’d have thrown myself off the Runcorn bridge if not! Practice went well on both bikes and the weather was looking good too. Finally some real time on the bike. I dropped the forks a little further through the yokes for the first race. Getting a great start I led from start to finish pushing the bike, which was a marked improvement again, to see where we were suspension wise. The bike was great, just a little too soft at the front briefly locking/pumping when hard on the brakes. I came in to find I’d set the fastest lap 1m42.1(my personal best is 1m41.7) and won by 14 seconds in a five lap race. I was really impressed with how the bike was turning out. Adding a little fork oil for the second race was the only change. The Hairy Snid ZX6 went well in the first race, just getting beaten by Kiaran Hankin in the latter stages of the first heat. The final of the Powerbikes was slightly delayed as there had been an accident requiring the air ambulance earlier in the day. The weather had gotten colder and windier so lap times suffered slightly. The bike once again felt great, I followed Hankin for the first lap and passed him into Druids. 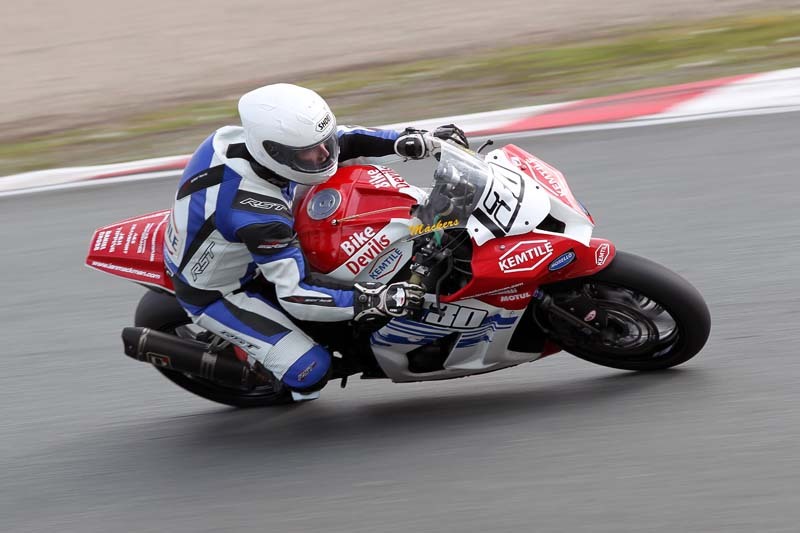 Then pushed on again, slightly slower lap times due to a bit less grip but the bike was superb. A big grin came over my face a few times especially in the direction changes through the chicanes, the bike was turning great and really settled when pushed hard from full lean to full lean. I won by 11 seconds and couldn’t have had a better finish to my last short circuit event before the TT. Small changes to the 600 had improved it again, although Kev Spur ( KS Performance) and I have decided to fit a harder rear spring for the TT. I was involved in a great four way battle for the lead, back in fourth for some of the race I made two passes on the last lap to finish second at the flag, only a few tenths off the winner. Probably the best race I’ve had all season. All in all a good meeting and well run by the Wirral 100 club given the forced delays. It was good to see Howard Tipping again for a chat and I have to thank him and his father, John, for their continued help for the TT. With only a few weeks until the TT, I now have loads of preparation on the ZX10 to do (have the tank fixed, swap engines, dyno, lockwire everything etc etc). I will also be out testing the Norton as well shortly, the bike is now nearing completion. It has been well documented in the press so there isn’t much more I can tell you here than you already know. A really exciting project to be involved with from day one. The goal to get the finish line will be realistic for us and I’ll do my best for all concerned. There will certainly be alot of people watching!! I have ridden the bike briefly for some high speed testing at Bruningthorpe and for a shakedown previously around the old melbourne hairpin at Donington. The bike made a good first impression and the engine, although still need to have the fuelling setup, feels strong from the bottom of the revs. Fingers crossed for a good TT, I think I might need to get my earplugs out though, as it is LOUD!! I’ll keep you posted on my TT prep and if you’re on the Isle of Man in early June, come and introduce yourself.